The bronzer edit featuring theBalm, Anastasia Beverly Hills, Becca, Marc Jacobs and more! 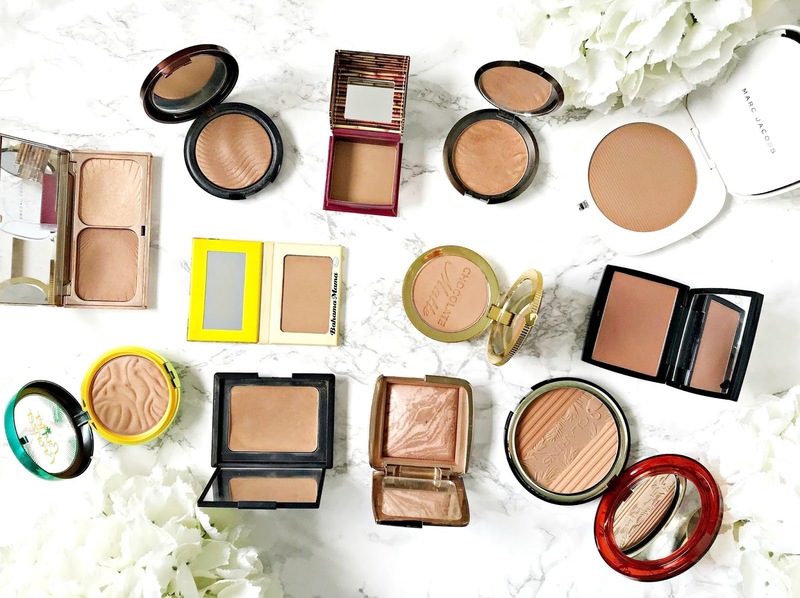 I actually didn't realise how many bronzers I had in my collection until it came to writing this post and this doesn't include those in palettes - I guess I'm a bit of a bronzer addict! For years, I only ever used either one of two bronzers: Nars Laguna or MAC Refined Golden. I honestly couldn't tell you how many times I repurchased those two. Since then, curiosity has gotten the better of me and I've also made new brand discoveries and once I like one product from a particular brand, I then want to try more so I will usually go on to try a highlighter or bronzer as they are two products that I use daily throughout the year. I love how a touch of bronzer adds warmth and dimension to my face - some I use to contour, some to add some life and some to bronze when my foundation is a little too light for my skin. I also love to use bronzer on my eyes on lazy makeup days! Today I want to share my collection with you and my thoughts on each one. I know my collection is excessive and I basically don't need to buy another bronzer for the rest of my days and I'm definitely not saying that you need this many in your collection - one or two would really do the job but it is what it is! I would love if you could recommend your favourite bronzer brush to me as I don't have that I love! I really didn't know where to start so I decided that I would just do them in alphabetical order because I don't really have an order of preference! Anastasia Beverly Hills Powder Bronzer: I have the shade Tawny in this bronzer, which is the lightest shade so I think that those with fair skin tones may struggle to find a suitable shade in this bronzer as my skin is medium and this bronzer has a warm undertone. This a matte bronzer - pretty pigmented but applies and blends well, without any patchiness. It can be used to add definition rather than a full contour or to add some natural looking bronze to the face. The texture of the powder is a dream to work with as it blends seamlessly into the skin and doesn't look too obviously bronzed. Another hit from Anastasia Beverly Hills. Available from Cult Beauty & Beauty Bay. Benefit Hoola: A classic that has stood the test of time. Another matte bronzer in a pretty universally flattering shade that is neither too grey nor too orange. I like to use this to contour but it also works to add an all over bromze. The powder is finely milled so it applies evenly to the skin without any patchiness. The small box is ideal for handbags to top up on the go! Available from Cult Beauty, Lookfantastic and Debenhams. Becca Sunlit Bronzer: Available in five shades, I have Capri Coast, which is ideal for bronzing but not for contouring as it's warm toned. The texture of the powder is soft but not so soft that it will drag or cake on the skin - it blends easily and seamlessly, which makes it an ideal bronzer for those with dry skin. It is perfectly pigmented but I still use a light hand (as I think everyone should with bronzer) as it can be layered. A little goes a long way with this - I've been using it regularly for around a year and have barely made a dent in it. Available from Cult Beauty and Space NK. Charlotte Tilbury Bronze & Glow: I adore the texture of this bronzer - it adds gentle definition and warmth to the face and doesn't highlight any dry areas. The colour of this duo (Light-Medium) looks very natural on my skin tone so I can bronze up to add life to my face without it looking very obvious, Available from Cult Beauty and Charlotte Tilbury. Clarins Bronzing & Blush Compact: This will last forever so if you need a new bronzer in your life, I recommend buying this one as it contains 20g of product! It has three shades that can be used either individually or, my preference, together. The texture is finely milled, which makes it very easy to apply and blend. This is limited edition so if you want to get your hands on it, order today! Full review here. Available from Debenhams. Hourglass Ambient Lighting Bronzer: I definitely could not be without this bronzer! The texture is absolutely beautiful - buttery soft, that blends seamlessly into the skin. This takes my skin from drab to fab in an instant! I have the shade Luminous Bronze Light, which is perfect for my medium tone. It's pretty heavily pigmented so a light hand is required and although it is mixed with a luminous powder, it doesn't give a shiny or discoball effect and can be used all over the face without the fear of highlighting pores or texture. It also lasts forever! Available from Cult Beauty & Space NK. Make Up For Ever Pro Fusion Bronzer: The formula of this bronzer is different from the others I own because it's almost like a gel-powder. This formula makes the product appear very natural on the skin and it doesn't cling to any dry patches or look too obvious. It is described as waterproof but I haven't tested that as I never wear makeup when I'm in the pool - there is more chance of me testing it in the rain! Available in 6 shades from Debenhams. Marc Jacobs O!Mega Bronzer: My most recent bronzer purchase! Clearly, I didn't need another bronzer but I have lusted after the coconut collection for the last few years and when I finally found the bronzer in stock, I ordered without hesitation. The pan is huge but the packaging is very slimline so it's probably ok to pop in your handbag (depending on the size of your bag, of course!). The powder is soft to touch and I find that it applies seamlessly to create a very natural look and it is ideal for adding definition. There are two shades available and I chose Tan-Tastic, which is perfect for my medium skin but may be a little too dark for those with fair skin. They need to expand their shade range! Nars Bronzing Powder: The classic! I have used this for years and probably always will. I love the formula - it never looks patchy on my skin and I love that I can contour or go for an all over wash of colour with this bronzer. The texture isn't at all stiff or powdery and it looks skin-like when applied. A cult product for a reason but it could do with being available in more shades. Available from Space NK, ASOS and Look Fantastic. Physician's Formula Butter Bronzer: This is a brilliant budget bronzer that was previously unavailable to us this side of the Atlantic. I picked mine up in New York but I have linked to iherb, where it is now available to purchase. It ticks all of the boxes for me - finely milled, blends without looking patchy, doesn't cling to dry patches and as a bonus, it smells of coconuts! Result! theBalm Bahama Mama Bronzer: theBalm is such an under-rated brand, in my opinion! I love the retro packaging of the products and the prices are excellent, given the high end quality of the range. This bronzer is matte and can feel slightly powdery to touch but it applies evenly to the skin without looking at all patchy or clinging to any dry patches. I like the slimline, yet sturdy, cardboard packaging, which is perfect for on the go!. Available from Look Fantastic & Beauty Bay. Too Faced Chocolate Soleil: Finally, another matte bronzer but this one smells of chocolate! As with all Too Faced powder products, this bronzer is pigmented and easy to work with. It looks very natural on the skin - not at all orange, it just adds warmth. This chocolate shade works well with my medium skin tone but there are also Milk Chocolate and Dark Chocolate options available for light and dark skin tones. The texture of the powder is very smooth so it would be almost impossible for this bronzer to look cakey on the skin. Available from Cult Beauty and Debenhams. Have you used any of these bronzers? Which is your favourite? I would also love to hear any bronzer brush recommendations that you might have! All products are bought by me, unless otherwise stated. The Clarins bronzer was kindly sent to me. Opinion is always my own.